Our product range includes a wide range of aluminum shot and aluminum cut wire shot for shot blasting. Aluminum Shot offered find application in degassing process in steel manufacturing industry. These shots are light in weight and are of small standard size that makes these deliver effective functionality in steel making process by providing superior degassing effect to metal and also in improving its overall finish quality. Some other applications include shot blasting, shot peening as well as in processes for removal of paints. 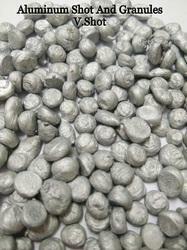 The company has emerged as a major Manufacturer,and Supplier of Aluminum Shot for Shot Blasting in Indore. The Aluminum Shot for Shot Blasting is manufactured keeping the commercial grade purity in mind. The Aluminum Shot for Shot Blasting is a customized product to the extent of more than 90% and can be made as per given specifications.